Ok, I saw this awesome behavior incentive on Pinterest today! I'm excited about it because it is something that I could totally do as a sub! From Something To Chirp About blog! Tomorrow is my friend's baby shower and I can't wait! I made her a cute baby card, I made her a cute subway art for the baby's room, and got the baby some clothes. I also got a pair of sunglasses. That is one of my baby shower trademarks I guess you could say. And it's funny because then people expect me to get their baby a pair, so I can't disappoint! Lol :) I'll post pics of the things I made tomorrow :) Have a great weekend everyone! Thanks for sharing I also saw this cute idea and immemdiately pinned it! This is so simple and cute and is so visual. Oh no problem. I love sharing great ideas! I think I may have to go out and buy a Mr. Potato Head today hahaha :) Thanks for stopping by! Fantastic idea! I can especially see it for your when you are subbing! I always break out some new whole group behavior (bribery) incentives around this time of the year when behavior tends to slip a bit. Last year I made a large paper fishbowl and when the group was doing well, we added a fish. When the bowl was full, I bought a real fishbowl and a fish for the class. Very fun! I also did a flowerpot with flowers and they earned something fun (can't remember, but may have been extra time outside! 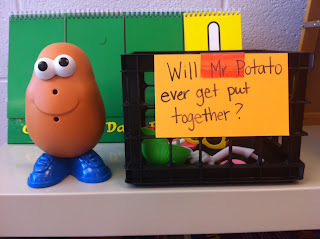 )I LOVE the Mr. Potatohead idea...time to head to Pinterest to find it. I added it to my behavior management board. Yay...thanks so much for the shout-out!!! Love the Mr. Potato Head idea! Genius! I love the Mr. Potato Head ideas so much...I'm thinking I really need to go buy one today. Love the Mr. Potato head idea! I can't wait to check out those new blogs :) Thanks! Sometimes I wonder, "Why didn't I think of that?" Lol. Simple and effective. Can't wait to try Mr. Potato Head out! This is a great classroom management idea. Love it! That's very cool and visual. Thanks for sharing. I love the mr. Potato head idea. I will be trying that with my classes. :) I can't wait to use it and see how it works with some of my tougher classes I sub for. Me too...that's why tomorrow I'm going to have a linky party about behavior stuff! Oh,I love that idea!!!!! I'm do mad that I gave my boys' Mr. Potato heads away...now I have to go out and buy more!!!! There's a spelling idea out there in blogland where you use Mr. Potato Head too...can't remember where I saw that though...HA! I'll have to look for the spelling idea. Oh I understand, sooo many blogs and ideas, so little time! Holly - We had about 8 of them at one point in time but my boys grew out of them and gave them away. Looks like I will be heading out to pick one up tomorrow and adding it to my teachers bag!